How I wish I could eat my eggs done this way everyday. You’ll say the same once you’ve tried these deceptively simple yet luxurious eggs. It’s from Dorie Greenspan’s Around My French Table – a book that I keep going back to for its elegant food. This particular dish is a fine example of how effortlessly one can create layers of flavour and elevate everyday ingredients like eggs to a decadent treat. The recipe calls for duck and almond pate, which substituted with foie gras and it worked superbly. Mushroom pate is a yummy option for vegetarians. Use homemade chicken liver pate and I’m sure it’ll turn out equally delicious. Despite the variations, it makes a stunning starter for a dinner party or a light entrée, when served with a fresh green salad at a romantic supper for two. Grab a rustic hunk of bread to dip into to make it perfect. Lightly butter four soufflé moulds or ramekins and get the steamer (bamboo is ideal) going over a large pot of boiling water. Chop pate into quarters and distribute evenly among the buttered moulds. Then carefully break an egg into each without breaking the yolks and season with salt and pepper. 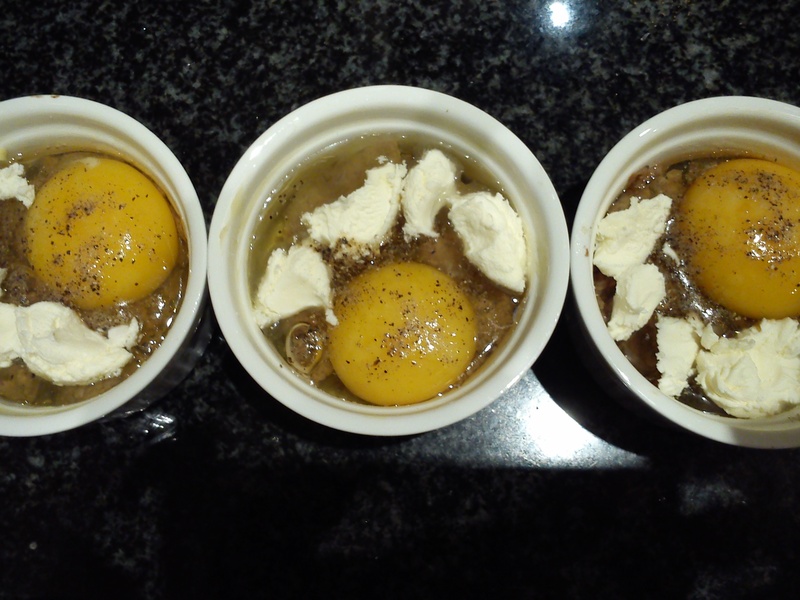 Spoon 1 tablespoon cream over each mould, sprinkle the herbs on top and steam for 5-7 minutes (the whites must be done and opaque but the yolks lightly cooked and runny). Remove from steamer and serve immediately.